/ What Are The Items To Get Rid Of When Moving? If you have lived in a comfortable home for many years and finally decided to move to a new location, the large number of items you have accumulated can be considered to be of great value. However, you need to let go of unwanted items as they will only take up more space in your new home. Aside from the tasks associated with moving out of your home, you will also have to deal with the items you need to get rid of when moving. The packing process is going to be a stressful time for you because aside from separating rubbish from the items you will still use, you need to think about ways you can get rid of accumulated treasures. Sort out your items. You will never know what you are going to get rid of unless you decide to sort out your belongings. It is one way to learn how to get rid of everything and move. You will need to categorise your items for a smooth relocation process. It also saves you the trouble of having to take care of too many household items. Label boxes for indispensable items, valuable items, unwanted items and damaged or broken items. This way, you will know which ones to keep, donate or dispose of. Sell stuff. If you want to know how to sell items when moving, all you need to do is to visit online auction sites where you can sell pre-owned or brand-new items. When posting your goods, make sure you include all the important details such as the brand name, the condition, features and your contact details. You will also need to be prompt in answering inquiries. Your description must also be as detailed as possible. Another way of throwing stuff away when moving is by organising a moving sale. Its success will depend on your resources and preferences. A garage sale enables you to reach out to potential buyers who are searching for a specific item. Direct communication is one of the main advantages of a garage sale. This is recommended if you have time and space. Make sure you sell in bundles. It will also be appealing to a potential buyer if you keep the area safe and attractive. Donate to charity. Items that have been bought can be donated to people in need. Donating your unwanted items is the easiest way to get rid of them. This is recommended if you do not have time to organise a moving sale. Make sure that items are well preserved before donating them. If there are items that cannot be reused, repurposed or recycled, you will need to consider a waste management solution. There are a few major methods used for removing rubbish. Disposing of your rubbish in a landfill is the most common method to use. It is also imperative that you are aware of the waste management and garbage disposal laws in your city so you can move with ease. 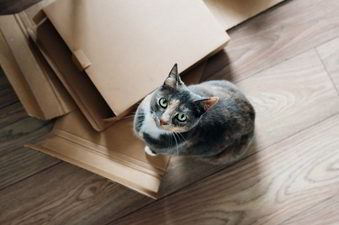 When thinking about the items to get rid of when moving, buying moving boxes will surely come to mind as this is where you will put all your stuff. Buy only from a trusted source. If you need help with rubbish disposal, Moves Transport will also be able to assist you.